See if you can get that earworm outta your head NOW. 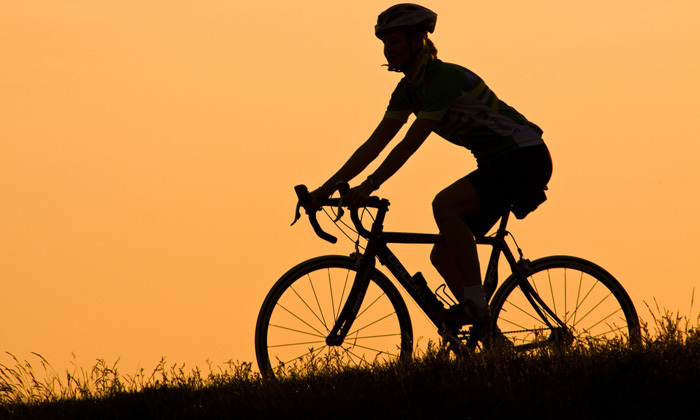 It’s National Bicycle Month – what does that actually mean, and why should you care? Because this month there are so many ways for you to not only get out and see Cary and our community on your bike, but you will also notice that lots of folks are already doing so – and we all want to be safe out there. I’m kinda a bike nerd. I didn’t start that way. 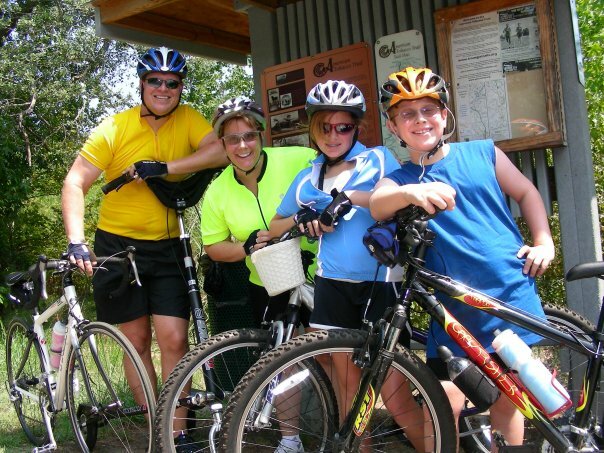 I took easy rides with the family and enjoyed just getting out there with the kids. 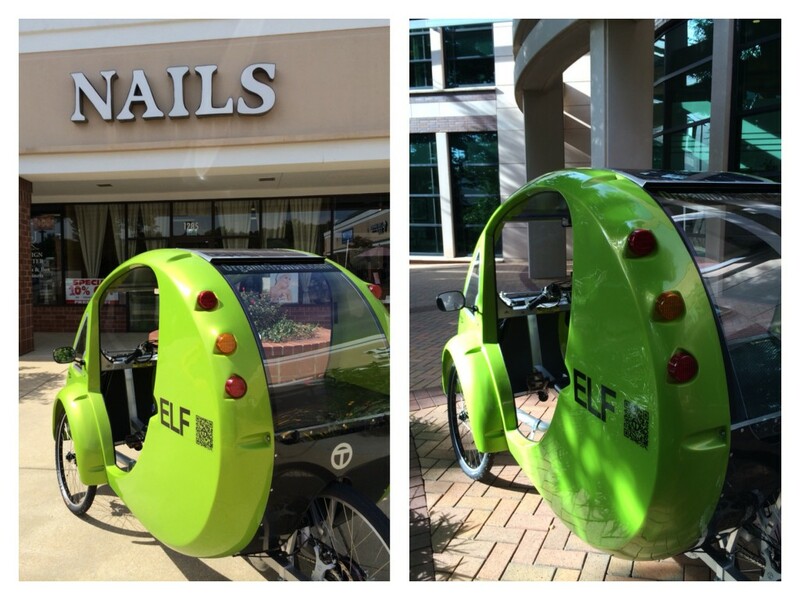 You may have seen this strange little green vehicle on the road around Cary. In case you were wondering who’s in that thing, it’s me. 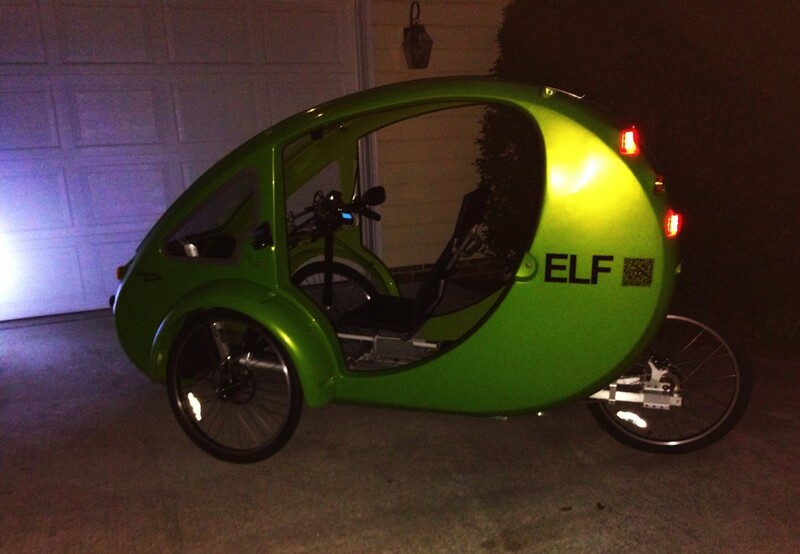 Meet my ELF – my new bike. Yes, it’s a bike. On steroids. The bike component of the ELF is a recumbent bike, meaning you are sitting closer to the ground with your feet in front of you to pedal, rather than upright and straddling a seat. With 3 wheels, (2 in the front, one in the back), it also has gears (a continuous gear train) and handle-bar brakes. On the car side – add a mostly enclosed cab (with a spacious lockable trunk), an electric assist that is powered by a rechargeable battery and solar panel, rear view and side mirrors and you have the hybrid picture. My ELFaba from Lori Bush on Vimeo. How far can the battery take me? Well, if I were to ONLY use the battery, no pedaling, the battery I have should carry me about 15 miles. (Although there is an upgrade available that will go 40 miles.) The solar panel on the roof can trickle charge the ELF when we are in the sun, fully recharging the battery in about 6-7 hours. Or, for a faster recharge, I can carry the small battery inside, and fully recharge it connected to my standard outlet in about 1.5 hours. 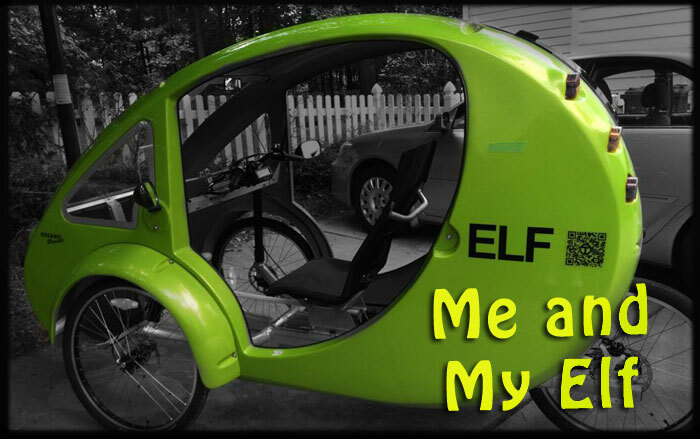 Unfortunately, the pedaling that I do does not recharge the battery, although I understand that will be an option on future ELFs. I was looking for a way to ride my bike that would get me a more “perspiration free” trip. The ELF gives me that! I can use the power in the battery on the way to a meeting, insuring a mostly “sweat free” appearance (minus the bike helmet hair) and then I often change to more comfortable biking clothes in order to get a better workout, and do more pedaling on the way back home. 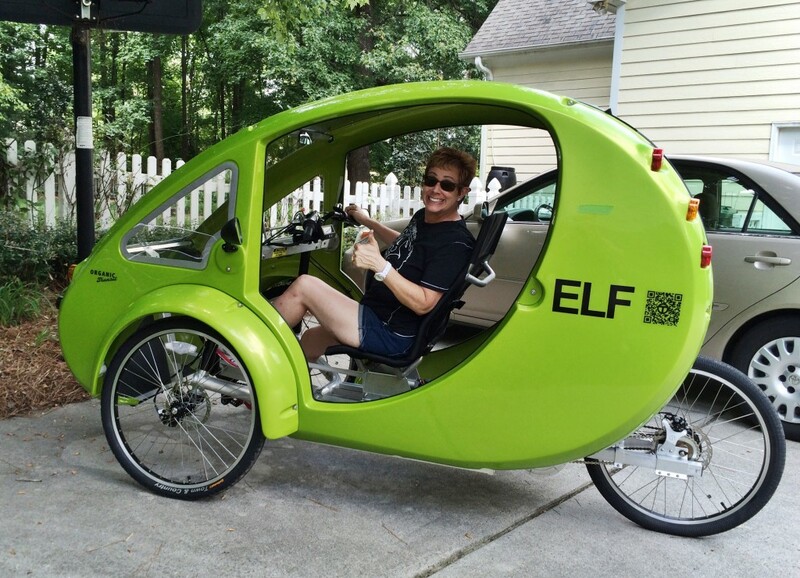 Although the ELF weighs about 160lbs (without me in it), I’ve found that it’s pretty easy to pedal, except up some BIG hills when I’m glad to have the use of the “power assist.” I’ve driven it on the road (it’s a bike!) and on the sidewalk and greenways. (Always wearing a helmet.) Riding it all around town, at all times of the day, part of the fun is seeing the looks I get from folks as they do a double-take; smiling, pointing and taking pictures. So far, people are genuinely kind and move over into the other lane when I am on the road, even when I am far to the right in the bike lane. At the end of the day, with Elf-aba, I feel like I have the best of all worlds. I’ve been able to add additional exercise to my routine, I’m still able to get around town, but by using less non-renewable energy, and still enjoy the outdoors and our wonderful community. All in all, it’s been one of my favorite benefits of reaching that BIG birthday milestone. 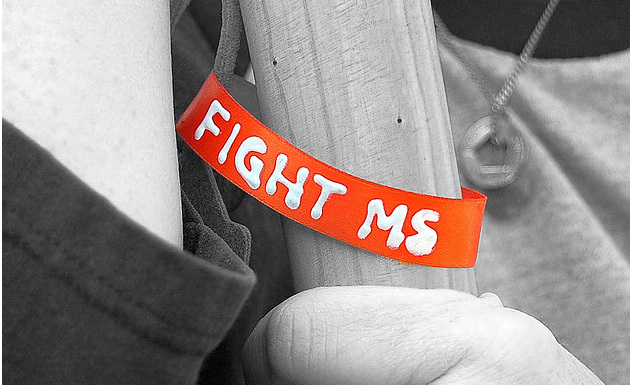 Do you know someone with Multiple Sclerosis (MS)? It’s highly possible, because every hour of every day, someone is diagnosed with the disease. And, if you do, then you know what a debilitating disease it is. I wish I could say I’m a cyclist. I’m not, really. I’m just a crazy nut that likes to get on my bike and ride for hours on end. Ok, maybe that’s the definition of a cyclist – who knows. What I do know is that this area is one of the absolutely best places to ride. 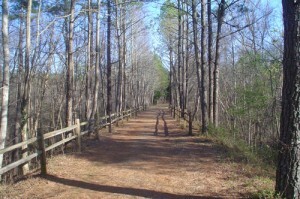 We have easy access to the gorgeous rural roads in Chatham County, nice quiet roads near Shearon Harris, wonderful greenways and the American Tobacco Trail. Whether you are a recreational rider, a die-hard commuter, or somewhere in between, you can find something that works for you.